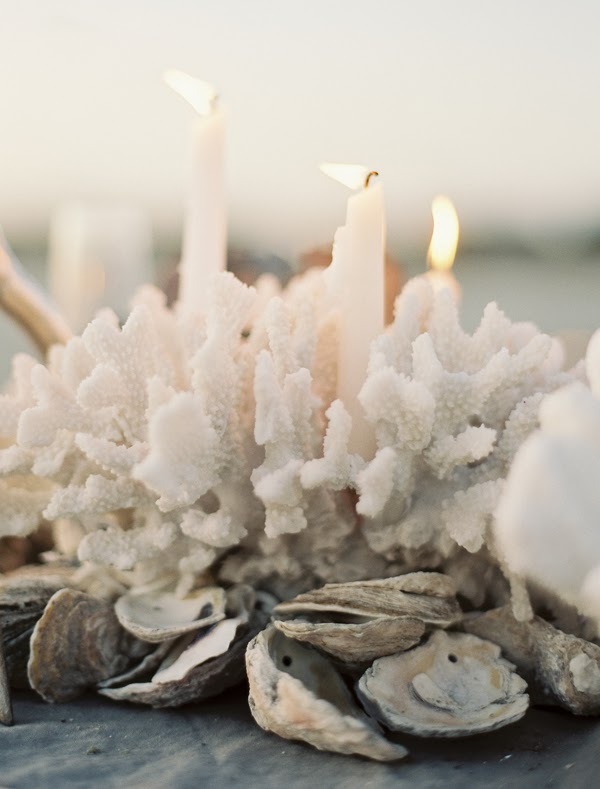 Memorable Wedding: Have You Ever Considered A Seashells Wedding Theme? 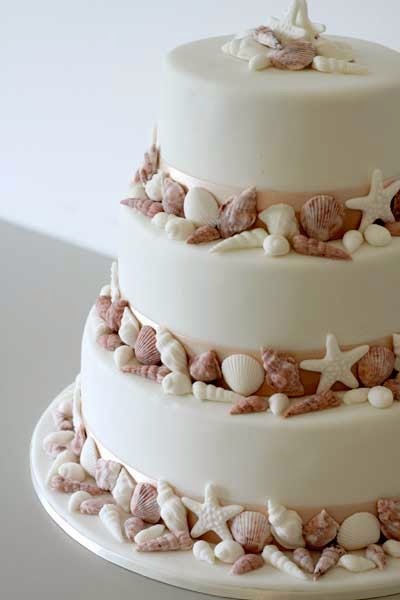 Have You Ever Considered A Seashells Wedding Theme? 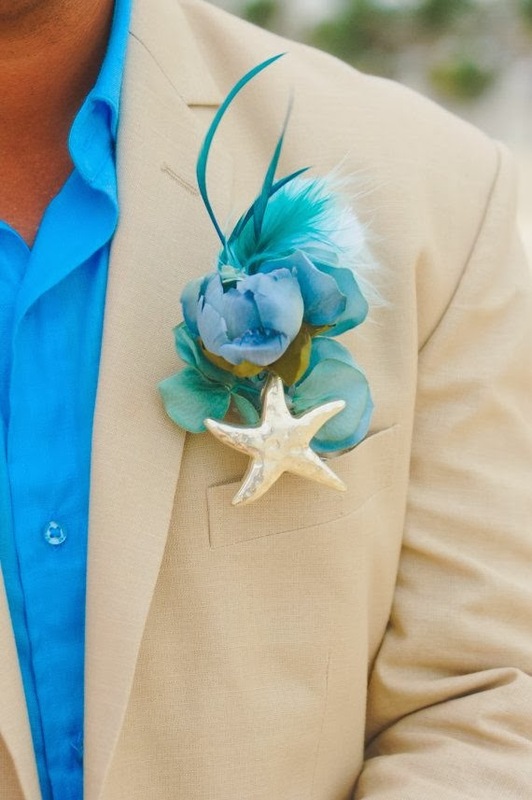 A variety of unique shells are a must-have detail for any beach or seashells wedding theme. It's easy to incorporate natures treasures into almost every detail of your seashells wedding. 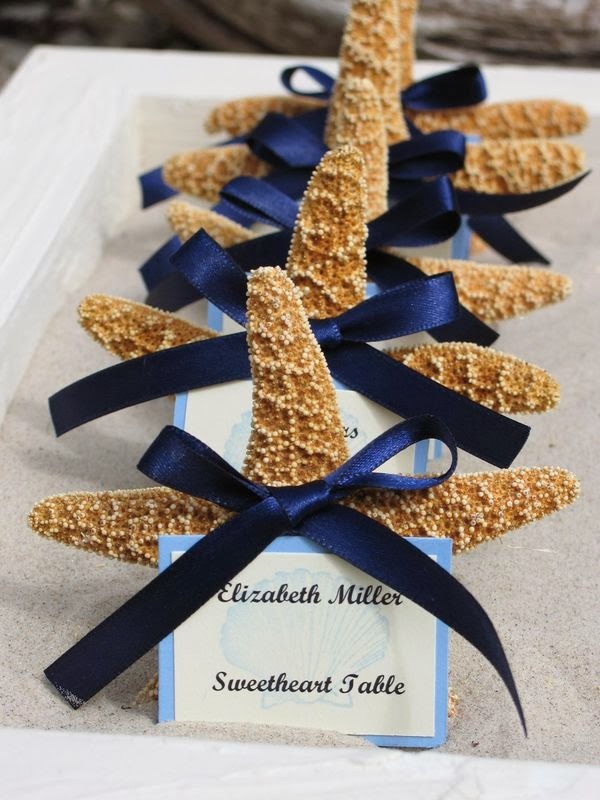 Seashell centerpieces, place card holders, unity candle sets, favors, bouquets are just a few of the items in which you can add wedding seashells to give your beach wedding an extra nautical flair. Many of these items can be personally hand-made if you have time and an interest in crafts, or may be purchased on-line at specialty web sites. 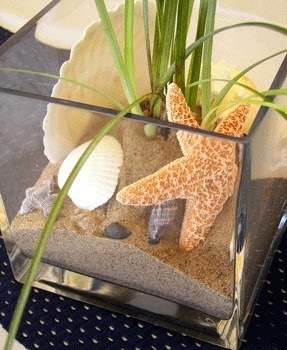 With any seashells wedding theme, extra attention to small details support your theme efforts and decor. Fortunately, there are many varieties of seashells to make your day memorable for your guests. Here are a few easy ways to incorporate these beautiful specimens into your seashells wedding theme. Use large, colorful shells to line your ceremonial wedding aisle or use as a focal point on your guests tables. Seasonal flowers can be placed in floral foam and placed inside the opening of larger shells as Murex, Conch or Nautilus. 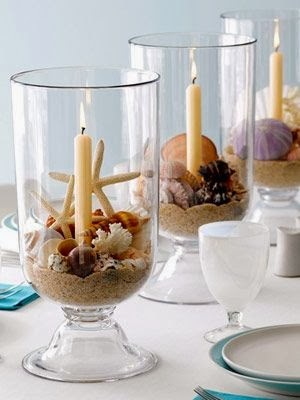 Other items may also be used as centerpieces and decorated with seashells - try using vases or baskets with smaller seashells such as starfish, sand dollars or scallop shells hot glued to the outer surfaces of these items. This is probably the simplest way to use shells to highlight your seashells wedding theme at your guest's tables. 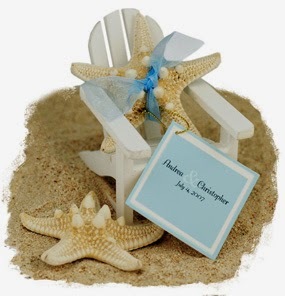 Almost any type of seashell will work- simply glue closely spaced beads or ring clips to hold the small card with your guest's name and table number. 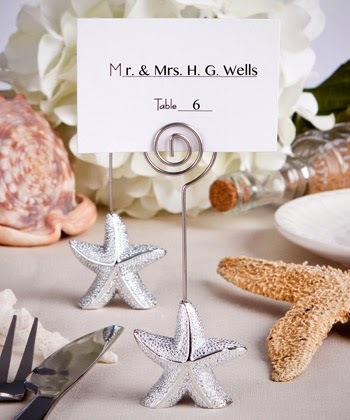 For an added touch, use a seashell rubber stamp or stencil to decorate the table card. 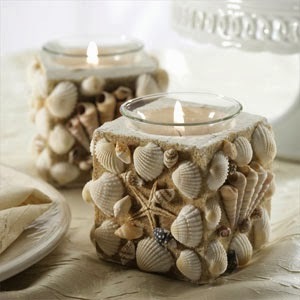 Seafans, starfish, sand dollars and scallops are great additions to pillar candles or candle holders. Seashells like these are easy to hot glue to the candle itself or to the outside of glass candle holders. You may also use larger cylindrical glass candle holders and glue smaller colorful calico scallops to the outside. When the candle is lit (you may also use small battery operated candles) the colorful wedding seashells give off a wonderful, cozy glow. 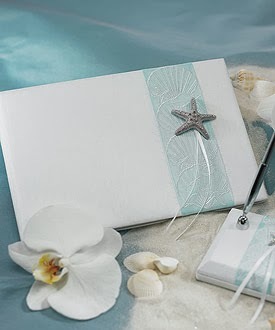 Customize your own seashells wedding guest book by adding a few special shells to the book's front cover. This will set the tone for your theme as soon as your guests arrive and sign the guest book. This is an extra special touch for your bridal party and guests alike. 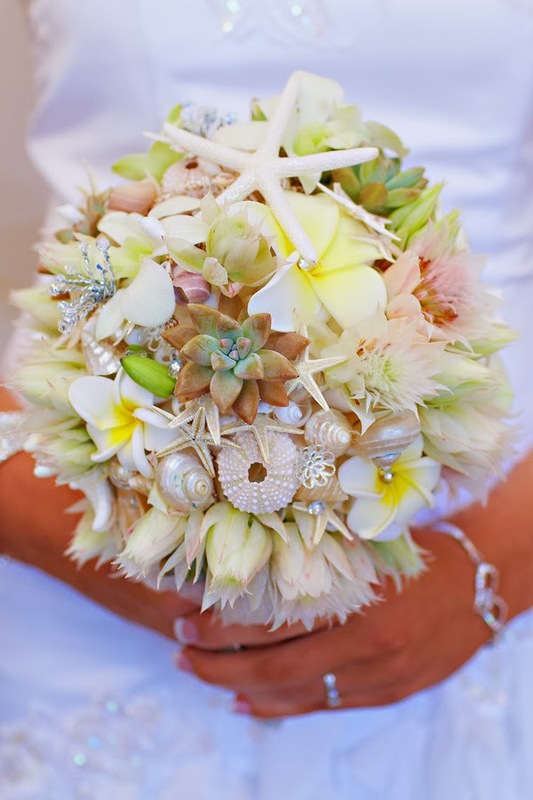 Incorporate a few small wedding seashells into your bouquet, your bridesmaids bouquets, groomsmen's boutonniers and mother of the bride and groom corsages. Small conches, scallops, angel wings, starfish or sand dollars make good choices. You can choose seashells in their natural state that blend with your color choices, or paint the seashells to match your color palette. 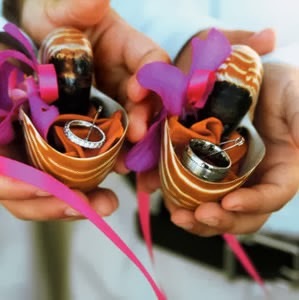 Present your wedding rings in seaside style, by having your ring bearer present them in a seashell wedding shell. Large white scallops may be decorated with pearls or small silk flowers or other smaller shells assembled to look like a small flower. To make the rings stand out, gently line the scallop shell with a custom cut piece of velvet to match your wedding colors. 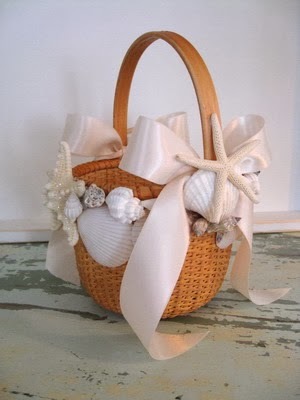 Decorate the basket your flower girl uses to hold her posie petals, with wedding seashells. You can glue seashells to the handle of the basket or create a band of seashells around the top of the basket. 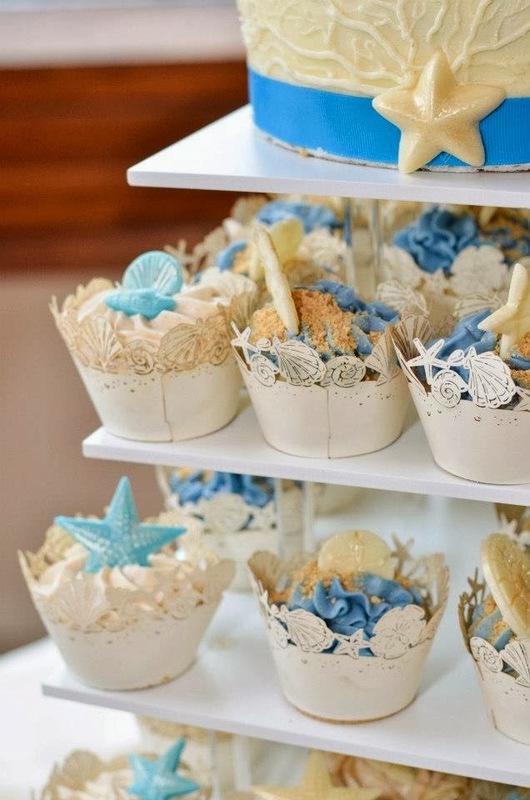 Traditional cake toppers and toasting flutes can easily become beach themed with the addition of a few strategically placed seashells. To give your cake topper a genuine seashells wedding touch, simply place a large scallop as a backdrop to the bride and groom or add some smaller seashells to surround the base. Accent the bride and groom's toasting flutes by adding a few smaller seashells and pearls, to the center of a bow tied around the stem. Cake Servers may also be accented with small wedding seashells added to a small bow tied around the handle. Hand write the bride and groom's names with the wedding date written on sand dollars for super-simple, elegant wedding seashell favors. Use thin, delicate ribbon strung through the top hole of the sand dollar and your favor may be used as a memorable Christmas ornament. Standalone shells with a small inserted airferm or flower make wonderful takeaways for your guests. Larger shells such as nautilus, murex, or conch are great specimen seashells to be used for wedding favors. There are endless ways to incorporate shells into your seashells wedding. No matter what kinds of wedding seashells you select, your guests and family will enjoy the memories for years to come.